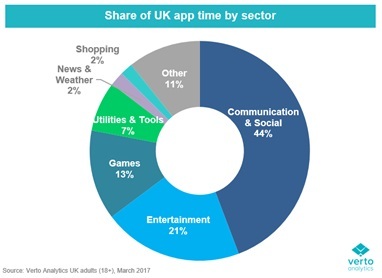 Measuring the cross-device behaviour of nearly 5,000 UK adults revealed the monthly time spent on communications & social media apps grew by 11.2 billion minutes (or 38%) over the last six months (Sept to March). 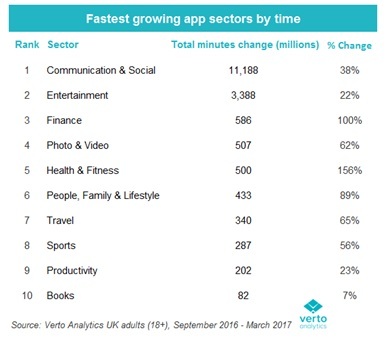 This made it the fastest growing app category and now accounts for 44% of all mobile app time. Entertainment had the next biggest rise, up 3.4 billion minutes (22%) to account for over one in every five (21%) app minutes. In contrast, the next biggest category by time spent, games, saw the biggest decline – by 2.4 billion minutes (-16%). 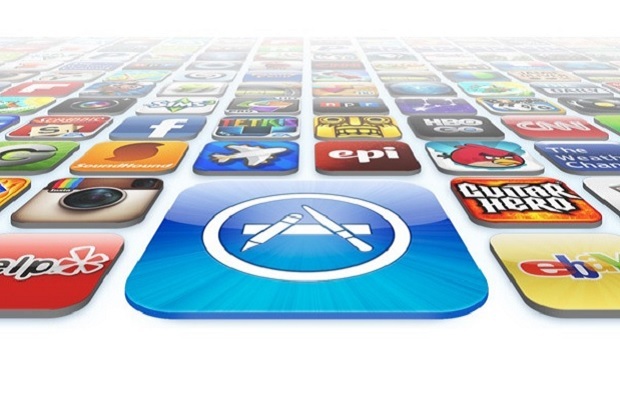 Consequently, games’ share of all app time dropped from 18% to 13%.